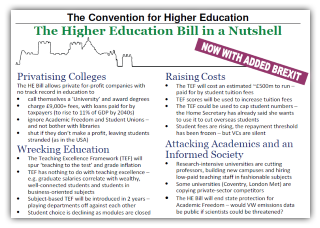 The following proposed amendments to the Higher Education and Research Bill 2016-17 were submitted to Gordon Ramsden MP by the HE Convention Steering Committee for inclusion in the Committee Stage of the Bill. Alongside these amendments we also submitted four explanatory documents drafted by members of the Convention. 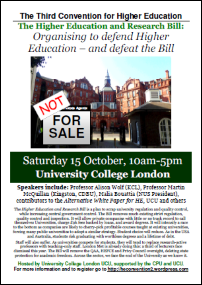 Amendment 1: That a separate monitoring body (the Office for Educational Responsibility, OER) be established, charged with monitoring the quality of educational provision within HE institutions, and with safeguarding the character of universities as places of free inquiry, and which will preserve its political impartiality by operating entirely independently of the Office for Students (OfS). Amendment 2.1: That the protection for academic freedom of inquiry in teaching and research will be explicitly defined as freedom for those engaged in its conduct, and not merely the institutions as corporate entities. (Well-defined only in Part 1, Clause 5, subsection 14). Amendment 2.2: With regard to research, and in particular the prohibition on Secretaries of State from imposing conditions on the funding of research, protection should be strengthened by making explicit that sections 93 (2) and 94 (2) of the Bill, as taken from section 68 of the Further and Higher Education Act (1992), should be understood as reinforcing that prohibition. Amendment 2.3: A commitment to the Haldane Principle should be explicitly stated in the Bill (it only appears in related documents). Sections Part 1: Misunderstanding (as administrative ability) in 4 places: Part 1, Clause 2, Subsec 2; Part 1, Clause 9, Subsec 35; Part 1 Clause 17, Subsec 66; Part 1, Clause 20, Subsec 69. Amendment 2.4: With regard to the revoking of the Royal Charters for Research Councils, there should be a clear statement of the objects of UKRI, and of its component Councils. At present a set of functions is given at 85(1) as what UKRIO ‘may’ undertake and are more limited than current objects (for example, there is no reference to social science). These objects should also have the protection of the Haldane Principle (as was the case with the Royal Charter of the Medical Research Council when founded in 1919). The Secretary of State should not have power ‘by regulations’ to add or omit a component Council or vary its field (87.5). Amendment 3: That new ‘providers’ will be required to demonstrate a track record of high quality HE delivery for a minimum of four years before they can apply for independent degree-awarding powers. Amendment 4.1: That the proposed Office for Educational Responsibility (OER) will be charged with advising the Secretary of State on the levels of funding required to sustain an appropriate range of types of expertise (disciplines) in the UK HE sector, independently of the conditions imposed on research funding via UKRI. Amendment 4.2: That the proposed Office of Educational Responsibility (OER) will be charged with ensuring adequate provision of library, IT, laboratory, studio and other resources for each of the disciplinary or interdisciplinary areas in each HE provider. Amendment 4.3: That in line with the recommendations of the Stern Review on the requirement of long-term block grants as the stable basis necessary for strategic investment in research, the UKRI be composed of four sub-divisions, namely science and engineering, medicine, humanities and social science, and that each will bear an explicit remit to advance knowledge and provide trained academic scholars to meet the needs of users and beneficiaries, and to provide advice on, and disseminate knowledge and promote public understanding of, the disciplines in their respective domains. Amendment 5.1: That the proposed Office of Educational Responsibility (OER) will establish an appropriate body to make direct assessments of teaching quality rather than determining quality on the basis of metrics that operate as proxies, assessments which measure the quality of provision in specific courses rather then the prior characteristics of the students following the courses, and will launch a national initiative in the sector (involving all constituencies) on determining the appropriate criteria for such assessment. Such standards must be no less than those demanded currently by the QAA, and should be applied uniformly across the HE sector. Amendment 5.2: That, in recognition of the distortions created by the considerable differences in the nature of different student bodies, both by institution and by subject area, and the difficulties in determining from the current process what is being assessed, the National Student Survey will not be used (as currently configured) for the purpose of course comparison. Amendment 6: All HE institutions in receipt of public funds will be required to complete the teaching of all courses for which they have admitted, and to offer to those students all of the core and option courses for which they originally contracted. Amendment 7: Ensure student and academic staff representation on all bodies in amendments to Schedules 1, 4, 8, and 9. This entry was posted in HE BIll and tagged academic freedom, amendments, further education, higher education, Office for Educational Responsibility, Office for Students, Research Councils, Royal Charter, TEF, UKRI. Bookmark the permalink.